The family of Virginia Tech gunman Seung-Hui Cho told The Associated Press on Friday that they feel "hopeless, helpless and lost," and "never could have envisioned that he was capable of so much violence." "He has made the world weep. We are living a nightmare," said a statement issued by Cho's sister, Sun-Kyung Cho, on the family's behalf. It was the Chos' first public comment since the 23-year-old student killed 32 people and committed suicide Monday. The family reached out to Raleigh, N.C., lawyer Wade Smith, who provided the statement to the AP. Smith said the family would not answer any questions. "Our family is so very sorry for my brother's unspeakable actions. It is a terrible tragedy for all of us," said Sun-Kyung Cho, who works as a contractor for a State Department office that oversees American aid for Iraq. The family's whereabouts are unclear. But authorities said they are under law enforcement protection. "We are humbled by this darkness. We feel hopeless, helpless and lost. This is someone that I grew up with and loved. Now I feel like I didn't know this person," she said. "We have always been a close, peaceful and loving family. My brother was quiet and reserved, yet struggled to fit in. We never could have envisioned that he was capable of so much violence." She said her family will cooperate fully with investigators and "do whatever we can to help authorities understand why these senseless acts happened. We have many unanswered questions as well." The statement was issued during a statewide day of mourning for the victims of the worst massacre in U.S. history. Earlier, shock gave way to grief as silence fell across the Virginia Tech campus at noon Friday and bells tolled in churches nationwide in memory of the 32 victims. Hundreds of somber students and area residents, most wearing the school's maroon and orange, stood with heads bowed at a memorial on the Drill field in front of Norris Hall, where most of the victims in Monday's massacre died. Along with the bouquets and candles was a yellow sign covered in maroon and orange handprints, bearing the words "Never forgotten." "It's good to feel the love of people around you," said Alice Lo, an alumna and friend of Jocelyne Couture-Nowak, a French instructor killed in the rampage. "With this evil, there is still goodness." The mourners gathered in front of simple stone memorials, each adorned with a basket of tulips and an American flag. There were 33 stones — one for each victim and Cho Seung-Hui, the 23-year-old gunman who took their lives. "His family is suffering just as much as the other families," said Elizabeth Lineberry of Hillsville, who will be a freshman at Tech in the fall. Devon Shields, a 26-year-old graduate student, stood just outside the ring of stones. "I almost feel guilty for not being here when it happened," said Shields, who was student-teaching when the shots rang out Monday. "I came here because I just had to connect with it in some way." Other students returned to daily activities, refusing to let one madman's actions define their lives or the university, reports CBS News correspondent Sharyn Alfonsi. Virginia Tech baseball players, for example, went back to the field. "We gotta do this," said Tech baseball player Nate Parks. "You can't let somebody who does something like this win." As experts pored over Cho's videotaped rant and his twisted writings, Gov. Timothy Kaine declared Friday a statewide day of mourning for the victims, and parents urged everyone to focus on the young people cut down in the attack, not the killer. "We want the world to know and celebrate our children's lives, and we believe that's the central element that brings hope in the midst of great tragedy," said Peter Read, who lost his 19-year-old daughter, Mary Karen Read. "These kids were the best that their generation has to offer." Churches around the country, from California to the National Cathedral in Washington, planned vigils and prayer services. "It's a whole family," said Jan Meehan-Tardiff of Blacksburg, a nurse who has four family members with degrees from Virginia Tech. Around Blacksburg, "you either work at Tech, serve Tech in business or go to Tech." President Bush wore an orange and maroon tie in a show of support. The White House said he also asked top officials at the Justice, Health and Human Services and Education Departments to travel the country, talk to educators, mental health experts and others, and compile a report on how to prevent similar tragedies. In Richmond, several thousand people jammed a park at Virginia Commonwealth University as a distant church bell tolled 32 times across VCU's silent urban campus. Beneath the park's massive oaks, people stood with their heads bowed, tears welling in their eyes. "As a parent, you just can't imagine what their families are going through," said Diane Willard of suburban Richmond. Her own two children attend a community college. Nearby, James Verlander, a burly Richmond firefighter, shed tears and tenderly recited a Christian responsive reading. "If this doesn't hurt you, something's wrong with you," he said. Memorial services were also held around the nation Thursday, with many conducted on college campuses. Nearly 3,000 students gathered at Western Kentucky University in Bowling Green for a vigil that included a banner that read, "Today We Are All Hokies." Private funeral ceremonies were held Thursday for two international students killed in the massacre. Egyptian Waleed Mohammed Shaalan and Partahi Mamora Halomoan Lumbantoruan, a civil engineering doctoral student from Indonesia, also will have funerals in their home countries. A funeral was held Friday in Israel for professor Liviu Librescu. As families mourned and began burying the victims, investigators worked on the evidence and looked into the warning signs in Cho's past, including two stalking complaints against him and a psychiatric hospital visit in which he was found to be a danger to himself. The Brady Center to Prevent Gun Violence, the nation's leading gun control group, has charged that neither of the guns should have made it into Cho's hands, reports CBS News chief investigative correspondent Armen Keteyian. "If the current law on the books had been effectively administered and followed, this individual would not have been able to buy these guns." According to the FBI, once a person is disqualified — "adjudicated," or judged, by a court to be mentally defective — "he/she is prohibited for life" from owning a gun. The Brady Center says Cho met that legal definition when a special court-appointed justice declared that Cho "presents an imminent danger to himself as a result of mental illness." But Virginia State Police tell CBS News that Cho was "not prohibited" from owning a gun because, despite declaring Cho a danger to himself, the judge did not commit him against his will to a mental health facility but instead ordered him to undergo outpatient treatment. When Virginia gun dealers did the required background checks, Cho's name was not in the system — and he walked away with two very deadly weapons. Today, the AFT, the federal agency responsible for regulating firearms told that its general counsel is reviewing whether the federal gun law was interpreted correctly. Meanwhile, Police filed a search warrant for a laptop and cell phone used by one of the first victims, Emily Hilscher, who was shot in a dormitory. "The computer would be one way the suspect could have communicated with the victim," the warrant said, but it offered no basis for a belief that Cho might have been in contact with her. Investigators are "making some really great progress" into determining how and why the shootings happened, Virginia State Police spokeswoman Corinne Geller said Friday. She said they hope to have something to tell the public next week. "The why and the how are the crux of the investigation," Geller said. "The why may never be determined because the person responsible is deceased." Cho fired between 175 and 225 rounds of ammunition, law enforcement sources told CBS News. The majority of the shots were from a 9 mm Glock. One law enforcement source told CBS News: "Once the shooting starts, there are always more shots fired than people think. That's kind of the nature of the beast." Authorities want to know why Cho selected Hilscher and Ryan Clark as his first victims. "We're trying to establish those links, if there are any," Geller said. The governor also appointed an independent panel that includes former Homeland Security Secretary Tom Ridge to look into how authorities handled the tragedy. Ridge said the group would look into the time lapse between the first attack and the second, how students were notified of the dangers, and whether privacy laws and the need to communicate for safety conflicted, among other things. "This was out-and-out murder," Ridge said. "This was a horribly, horribly deranged young man." Asked if the attacks had been preventable, Ridge said his "preliminary judgment would be probably not," but he said he hoped the investigation would find ways to reduce the risk in the future. "This is a national tragedy, and we have to learn some lessons and apply them," Ridge told CBS' The Early Show. "The last thing we want to do in our universities and public places is turn them into citadels or armed fortresses." Cho's videos, which were mailed to NBC the morning of the killings, revealed a man angry at the world but offered little explanation of why, other than rambling tirades against rich kids, snobs and people who had wronged him. As experts analyzed the disturbing materials, it became increasingly clear that Cho was almost a classic case of a school shooter: a painfully awkward, picked-on young man who lashed out with methodical fury at a world he believed was out to get him. "In virtually every regard, Cho is prototypical of mass killers that I've studied in the past 25 years," said Northeastern University criminal justice professor James Alan Fox, co-author of 16 books on crime. "That doesn't mean, however, that one could have predicted his rampage." Among other things, the South Korean immigrant was sent to a psychiatric hospital and pronounced an imminent danger to himself. He was accused of stalking two women and photographing female students in class with his cell phone. His violence-filled writings were so disturbing he was removed from one class, and professors begged him to get counseling. Classmates in Virginia, where Cho grew up, said he was teased and picked on, apparently because of shyness and his strange, mumbly way of speaking. 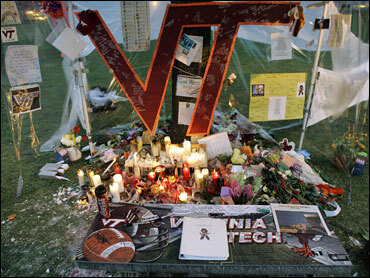 Among the victims of the Virginia Tech massacre were two other Westfield High graduates, Reema Samaha and Erin Peterson. Both young women graduated from the high school last year, but police said it is not clear whether Cho singled them out. Despite near-universal sorrow over the Virginia Tech shootings, the nation is profoundly split along gender, racial and other lines over gun violence and what the government should do to control it, an AP-Ipsos poll has found. The 22-caliber Walther semi-automatic pistol used by Cho Seung-Hui in the Virginia Tech massacre was purchased on the Internet from a Green Bay, Wis.-based Web site, The Gun Source. Cho bought the pistol with a credit card for $267 on Feb. 2 and picked it up one week later, as CBS News previously reported, at JND Pawnbrokers, near Virginia Tech's campus in Blacksburg, Va, CBS News reports. Columbine High School was closed Friday, as it had been every April 20 since the 1999 attack in which two students, Eric Harris and Dylan Klebold, killed 12 classmates and a teacher before killing themselves. Invoking the Columbine tragedy, Gov. Bill Ritter asked state residents to join a bell-ringing and moment of silence for the Virginia Tech victims.